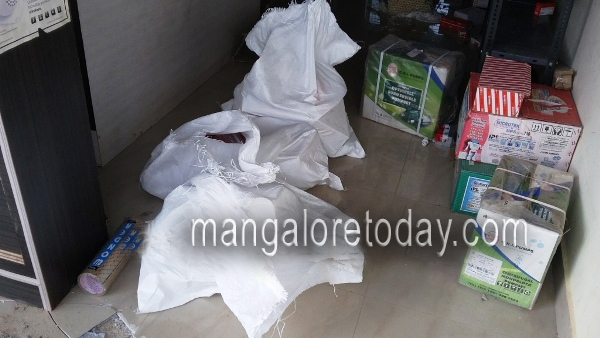 Kundapur, July 8 2015: A group of men suspected to have robbed three shops prevailing at the first floor of Vigneshwara Complex on Monday July 6. Sunshine Electricals, Amba Home Appliances and Vinaya Digital studio of Hemmady in Kundapur were the shops looted. It is said that the shutters of the shops were forcefully opened to do this act. Switch boards were taken from Sunshine Electricals Wires and cash from Vinay Digital studio . The major theft was in Amba Home Appliances where more than 25 mixer grinder, 2 LED TV’s, V-Guard Stabilizer’s and other Home appliances. The theft came to the notice of the shop owners on Tuesday morning July 7, when they came open the shop as usual. They noticed that the shutters of the shops were kept half open and they informed the police immediately. Vigneshwara Complex had CCTV camera in the groung floor. The CCTV footage shows that this activity was performed by three men came in a Eicher vehicle around 1.45 – 3am. From past one year incidents are common in the places between Udupi to Kundapur. Cell Phones worth lakhs were stolen from Koteshwara .The police got some clues from the theft of mobile phone in Koteshwara and a recent theft in Kalikamba Temple Barkur. Still the enquiry is going on, based on these thefts the police is trying to trace the for root of this serial theft. Kundapur DYSP Manjunath Shetty, DCIB inspector Jaishankar, and SI Nasir Hussain along with forensic experts visited the spot. Kundapur Police is investigating the case. The police has to take special interest in this case. The theft is increasing day to day.What is the reason for this. The theft is increasing day by day. The people arrested should be punished strictly.